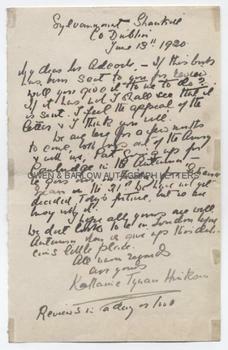 KATHARINE TYNAN Autograph Letter Signed. Katharine Tynan Hinkson. Irish novelist and poet. ALS. 1p. Sylvanmount, Shankill, Co. Dublin. June 13th 1920. To "My Dear [Arthur St John] Adcock". "If this book has been sent to you for review, will you give it to me to do? If it has not I shall see that it is sent. I feel the appeal of the letter and I think you will. We are here for a few months to come, both boys out of the army and with us, Pat going up for Cambridge in the Autumn, he [. . .?] on Friday for 'Entrance' exam on the 21st. We have not yet decided [Toby's?] future, but we are busy with it. I hope all yours are well. We [. . .?] Cork to be in London before Autumn when we give up this delicious little place. All warm regards, ever yours, Katharine Tynan Hinkson. Reviews in a day or two." 8vo. approx 7 x 4.5 inches (18 x 11.5 cms). Some small edge stains from old mountings, else VG. Katherine Tynan was one of 12 children born to an Irish Catholic family. Her first book of poems was influenced by Christina Rossetti but, upon being urged by W B Yeats to "make a speciality of her Irish Catholicism", her second book, 'Shamrocks' was exclusively Irish in content and, according to Yeats, "in finding her nationality, she found herself". Katharine Tynan was a member of the Ladies Land League with Anna Parnell. She idolised Charles Stuart Parnell and supported him in her writing after his downfall. It is believed that W B Yeats proposed marriage to Katharine Tynan in around 1885 but was rejected. She later married the English banker, Henry Hinkson. Arthur St John Adcock was a poet and novelist and for many years was sole editor of 'The Bookman'. Katharine Tynan is probably here writing in connection with a proposed review for that publication. Work by Tynan appeared in Adcock's 'Treasury of Living Poets' published in 1931. 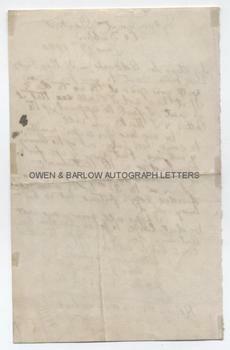 Autograph letters of Katharine Tynan are uncommon.